Why not try whipping up a batch of our easy dog biscuit recipes for your Cocker Spaniel? Apart from being easy and fun to make, they're really delicious. Your dog will love them, but best of all he'll love you for making them! Here's a tempting selection of quick and easy dog biscuit recipes for you to bake (and your dog to taste). You'll find tasty treats such as Chicken and Parsley Bites, Savoury Oatmeal, Liver Crunch (our Cocker's favourite!) Chicken and Sunflower Biscuits, and Cheesy Dog Biscuit Treats (another all-time favourite)! Switch off the oven and leave the biscuits to cool overnight. The number of dog biscuits these recipes produce may vary depending upon the size of cutter or shape used. Share your own dog biscuit recipe here! This is such a quick and easy dog biscuit recipe so your dog can look forward to his tasty treats within minutes! Store in a refrigerator for 7 - 10 days. Share your own biscuit recipe here! 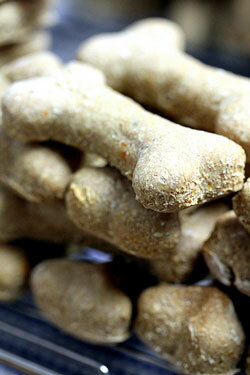 In our opinion, and our Cocker Spaniel's, this is one of the tastiest home made dog treats around! Allow the biscuits to cool in the oven and place in a airtight container. Share your favorite dog biscuit recipe here! Transfer the cookies onto a cooling rack and allow to cool. Share your own easy dog biscuit recipes here! Place the biscuits onto a non-stick baking tray and bake for 15 minutes. Share your own biscuit recipes here! More Easy Dog Biscuit Recipes For You To Enjoy! If you've enjoyed our easy dog biscuit recipes and you'd like to try some more, you'll find a great selection of recipes for delicious home made dog treats. Simply follow the links below. If you're looking for something special to bake for your Cocker, why not try these gourmet dog biscuit recipes? Our Cocker goes mad for peanut butter and will do anything for these tasty peanut butter dog treats!